I'm thinking whether the following way is a good way to completely and totally prevent ddos on my server. My idea is to use the same mechanism of cryptocurrency mining (bitcoin, with sha256 or any other hash) to prevent DDOS. Note: I'm not suggesting to mine cryptocurrency per se. I'm suggesting to use the same mechanism to avoid Sybil attacks. Why does idea look appealing to me? Because creating a mined hash is expensive, but verifying it is super-cheap. it costs only calculating a hash once. What does mining mean, in a nutshell? It means that there's a specific chunk of data (say a session id, or a JWT token, that can be stored in the server in a performant NoSQL server), and the user (or the miner in cryptocurrency) has to create a hash that matches certain criteria. For example, if we use SHA256, we can define the difficulty as the required number of the leading zeros in the 256-bit resulting number from the hash. More zeros make the probability of finding that hash more difficult. 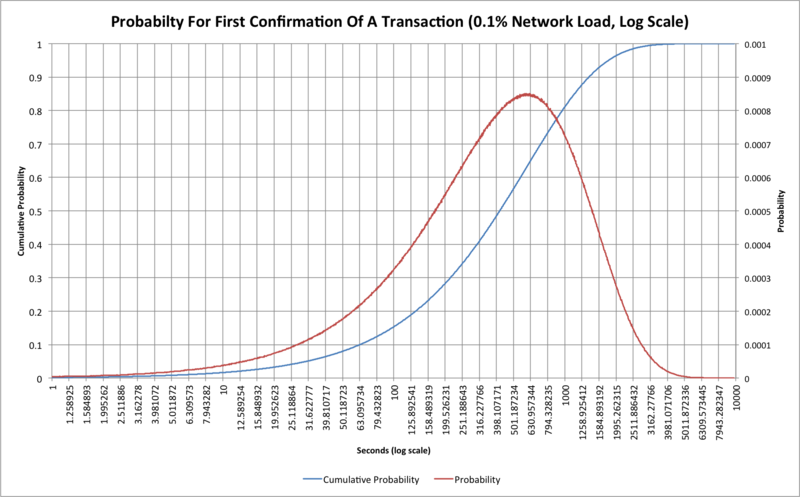 The graph shows the probability of finding a block (finding the correct nonce) in Bitcoin, where the difficulty is chosen to make it 10 minutes. Changing the difficulty will shift this curve and change its width proportionally. How long does it take the server to verify? Practically zero. Just calculate the hash once and ensure that it matches the given difficulty, and that authorizes the user to make any anonymous request. Notice that none of this requires authentication with usernames and password. This is all anonymous. Authenticated users don't need to do this as their credentials can be banned from the system. This is all for anonymous users (and possibly attackers). The result: The user will have to calculate this hash with this difficulty before making any request to the server. Once the user succeeds, the mined authentication token can be stored in a cookie to be reused by the user. If the user fails to provide the requested hash, his connection request will be abruptly reject, and thus preventing a DDOS attack with sock-puppets. ASIC resistance: Using SHA256 is not recommended because there's specialized hardware that can calculate it very fast, leading to a possible coordinated attack. There are hashes that are hard to print on hardware, such as Scrypt and Argon2. Choosing the difficulty: The difficulty can be static (which I wouldn't recommend), or can be dynamic to change with the load on the network. When a high network load exists, the required difficulty is increased. This basically will act as a filter and protect the network during DDOS attack times, and never affect the users, as users normally wouldn't care to wait 10 seconds to create a session. In case of really high load, the users can either choose to compute the expensive nonce, or come back later. The hosting company also can decide whether an expansion of the infrastructure is required based on the difficulty chart over time. Is this a sound plan to protect against DDOS on websocket and similar public protocols? I would like to implement this on my server. EDIT: Just to be clear, this is not a silver bullet to all kinds of DDOS. But this prevents the users from manipulating the internal functionality of the server + makes it difficult to use the server functionality to exhaust bandwidth. I would be interested in knowing why this may or may not work, more than a summary on whether this is new or old. TL;DR: This is not a solution against typical DDOS. It might be a protection against some very application specific DOS. Taking away all the mining stuff your idea essentially means that the client connects to a server to get some hard to solve task and later comes back to present the easy to verify solution for this task. The problem with this approach is that the clients needs to connect to the server first and that the server needs to be able to reply with a task to the client. This means your idea cannot protect against the most common bandwidth oriented DDOS attacks which simply send more traffic then upstream systems or the server can deal with. Neither will it help against simple DDOS attacks which try to exhaust resources of the server itself, i.e. things like SYN flooding or Slowloris. It can actually help against attacks which are targeted at later stages of the processing, i.e. attacks specific to the application. But it isn't actually a new idea in this area, it is essentially just another Proof of Work System as they are known for many years. So, we're speaking now of application layer DDoS attacks only. What you propose is known for long as proof of work. Numerous attempts were made to put this general approach in against application layer DDoS attacks, with little success though. Basically, either the challenge that you introduce for a suspected bot would be simple and short enough to be finished in a-couple-to-a-dozen of seconds, or it will take a really long time. In the first case, a typical botnet is believed to have thousands of machines under control, and the attacker gets all the computational resources on those machines, more or less, for free. Forcing all those machines into computing something just once for about 10 seconds isn't going to prevent an attack. In the other scenario, you'd probably still lose almost all the customers of a, say, Web site because a legitimate user will rarely wait for minutes for your pages to load. Actually, popular Web sites are now fighting for milliseconds of page load times, introducing numerous techniques (CDN, 0-RTT and others) exactly for that purpose. So though formally your server won't be flooded with malicious requests, the end result would be virtually the same. For some specific applications, in theory, there could be some reason to implement a technique similar to what you're thinking of. But for an arbitrary Web site, unfortunately, it's not going to work well. Not the answer you're looking for? Browse other questions tagged network hash webserver server ddos or ask your own question. With ASIC bitcoin miners, should SHA256 be considered insecure for password hashing?